Part 2 of the Connection Planning Series will explore the idea of using the consumer's environment to enhance the brand's message. Want to read more about connection planning and the idea of reaching the consumer when they're in the right mindset? Check out Connection Planning Part 1: Mastering the Mindset. This post in the series will cover point number two - the consumer's environment. When enhancing the environment of our consumer, we must ask ourselves, "When is the consumer in the environment that will bring the idea to life?" The consumer's environments are the places and situations that surround them throughout their day. These could include both the physical environment that they're in as well as the non-physical. When the problem being solved or the brand idea being communicated relies on the consumer to be feeling like they're in a certain place, we must look for a time and place during the day or week when we can manipulate an environment to make them feel that way. When the brand idea relates to a feeling or emotional state of being that isn't necessarily tied to a physical space, but rather a sound, smell, taste, etc., we have to look for the time and place where they're most likely to be responsive to that. Thus, when the consumer is in the right environment to receive a certain message, or when the message is specifically relevant to the environment that a consumer is in at that moment in time and space, the impact of the message is much greater than something more generic. Below are three examples of campaigns that have enhanced the environment of the consumer. Subaru needed to find a way to communicate that its latest iteration of the Outback wagon was perfect for consumers looking to take advantage of the vehicle's all-wheel-drive to explore more rugged terrain. The brand idea was that the Outback can help consumers "get out more". Thus, the brand needed to reach consumers in an environment when they are most likely to be responsive to the idea of getting out a bit more. What better environment to enhance than the living room, home of couch potatoes staring mindlessly like zombies at their flat-screen entertainment centers? Subaru's TV spot sought to play on this environment by toying with the nature of the television screen. The spot begins with a typical, late-night infomercial for the Snuggie, a commercial that's bad enough to be interesting but not enough to be boring. After drawing you in, the ad suddenly surprises, as a crowbar emerges from behind your TV screen and rips it right out. Immediately your TV has become a window into an idyllic forest landscape, opening your eyes to what you're missing out on. Idling in the center of this beautiful landscape, of course, is the Outback. Mini needed to communicate several advantages of being a Mini driver, including driving a really fast car with "go kart" handling. The brand is also famous for building a repoire with those who drive Minis. The best environment to do that, of course, is on the road, where people are actually thinking about driving. Mini played upon several environmental insights. The first is that people who love to drive above the speed limit often scan their environment to look for police or speed traps. Mini, being a friend to fast drivers, decided to help out, with billboards warning drivers about waiting cops with copy like "Cops hide here." Of course, police weren't necessarily hiding there, but drivers got the point. Another insight is the tendency of drivers to scan their environment for anything that might be out of place while driving. 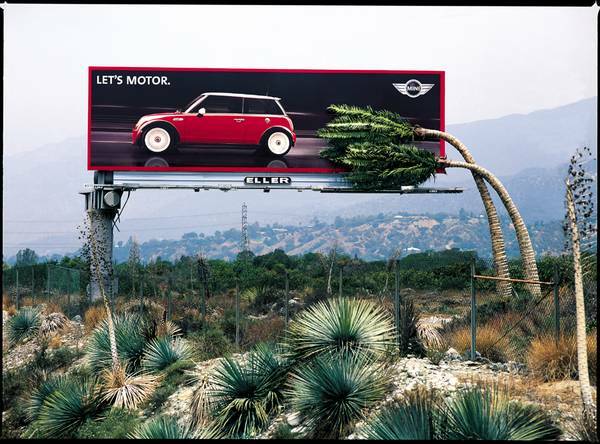 In the "Let's motor" billboard above, the brand hopes drivers will do a double-take at the palm trees bending from the speed of a Mini blowing by. Finally, drivers are often scanning their environment for critical information, like those on digital boards that are set up along highways and roadways. In the final image above, Mini set up its own digital information board. Rather than providing critical information, however, the boards provided smiles - as Mini owners drove by, the board used a digital signature to recognize the driver by name and offer a quick hello. I'll keep this write-up short since the video below pretty much explains the background, insight, and execution of this campaign. But in a nutshell, Scream TV (now called Dusk), a specialty TV channel, enhanced the non-physical environment of innocent bystanders by projecting sounds that would freak them out. What a great example of using the environment to bring a brand idea to life!